Windowed functions are a powerful feature of T-SQL, allowing you to perform advanced aggregates. They provide a very efficient way of doing this as soon as you just get the hang of the OVER() clause. The common denominator for every windowed function i T-SQL is the OVER() clause. OVER() is added to any aggregate function that you want to turn into a windowed function, as well as those that are always windowed functions. The OVER() clause can contain PARTITION BY and ORDER BY or both, depending on the function. You can use OVER() on all aggregate functions except GROUPING(), GROUPING_ID() and COUNT(DISTINCT). Both standard aggregate functions and windowed aggregates using the OVER() clause perform aggregations. The main difference, however, is that whereas a standard aggregation uses a GROUP BY clause that is common to all of the aggregations, PARTITION BY allows you to define the GROUP BY expression for each aggregate function separately. The MIN() and MAX() columns are calculated as windowed aggregates over all rows with the same FromCurrencyCode and ToCurrencyCode. In conclusion: GROUP BY applies to all columns and requires all columns to either be in an aggregate function or in the GROUP BY clause. PARTITION BY defines an individual “GROUP BY” for each function. ROW_NUMBER() is the simplest one, returning a running row number, starting at 1 and incrementing by 1 for each row. If you use PARTITION BY, the counter will start over at 1 for each “partition”. RANK() works like ROW_NUMBER(), except it employs a ranking function similar to what you would see in sporting results, with “shared” ranks. 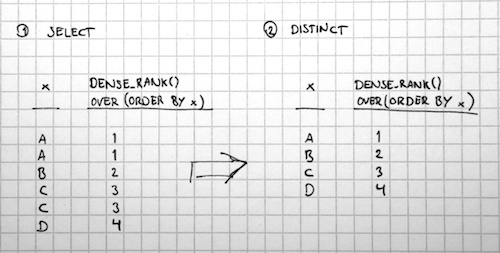 DENSE_RANK() works like RANK(), but distincts the values before ranking them. The reason is, of course, that the ROW_NUMBER() column is calculated first, and because it contains a unique number on every row, there are no duplicate rows to remove using the DISTINCT operator. However, the RANK() and DENSE_RANK() functions return unique values for each x. This makes them better suited for use with a DISTINCT keyword. In other words, if you want a row numbering function to work with a DISTINCT query, you’re better off using DENSE_RANK(). As of SQL Server 2012, there are two new functions called LEAD() and LAG(), among other new, practical windowed functions. These functions return the “next” and “previous” rows respectively from the result set. But they will be the subject of another post entirely. As usual, if you have any questions or ideas, let me know!